Carry thee in their hearts. From end to end of our land. To protect and guide us. Of my mother and of God’s. This entry was posted in Holidays, Poetry and tagged Aztec Poetry, Aztecs, Blessed Virgin Mary, Catholic, Catholic Poems, Catholic Poetry, Feast of Our Lady of Guadalupe, Mary, Mexico, Mother of God, Our Lady, Our Lady of Guadalupe, Saint Juan Diego, Song to Our Mother, Tonantzin Icuic on December 12, 2018 by The Mithril Guardian. I posted this song/poem last year. Unfortunately, I did it on the wrong feast day! 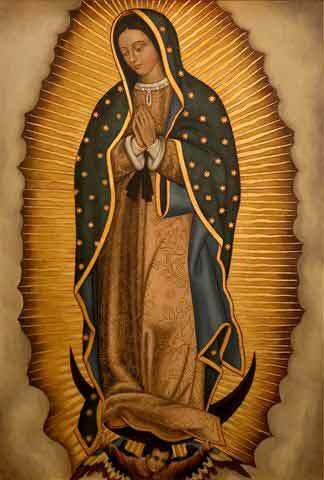 I published this not on the Feast of Our Lady of Guadalupe but on the Feast of the saint to whom she appeared, Juan Diego. This year, however, the post is going up on the right feast day, December 12! 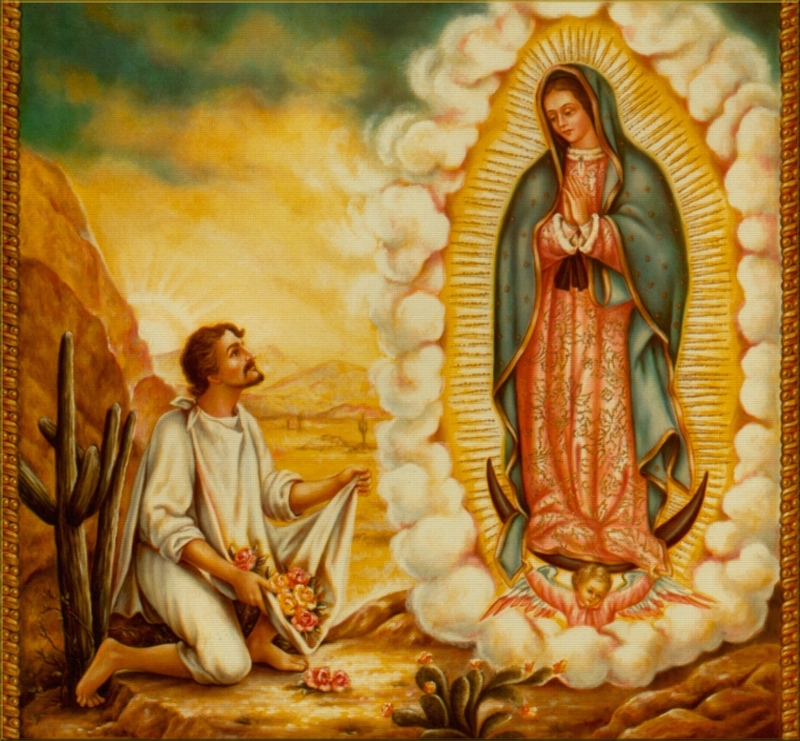 The song below is (or was) sung by pilgrims to the chapel of Our Lady of Guadalupe in Mexico. I found it near the end of the book America’s Treasure: The Virgin of Guadalupe, by Helen Behrens. The original song is, I think, written in Aztec, not Spanish. Below is the English version, accompanied by the Aztec title. I would have included the Aztec in this post, except that I could not be sure I would not misspell a word. It is probably possible to find Tonantzin Icuic somewhere on the Internet; it may even be possible to find the song being sung. I do not know. If these two options are somehow unavailable, I recommend you try to find America’s Treasure: The Virgin of Guadalupe. It is a fascinating little book, with lots of amazing details – including this song! God and Mary go with you! This entry was posted in Holidays and tagged America’s Treasure: The Virgin of Guadalupe, Aztecs, Blessed Virgin Mary, Catholic, Catholic Missionaries, Catholic Poems, Catholic Poetry, Catholicism, Feast of Our Lady of Guadalupe, God, Helen Behrens, Holy Spirit, Jesus Christ, Marian Apparitions, Mary, Mexico, Mother of God, Our Lady, Our Lady of Guadalupe, Poems, Poetry, Roman Catholic, Spain, Spanish, St. Juan Diego, The Holy Family on December 12, 2017 by The Mithril Guardian. Now sang an Indian lullaby of roses and wild birds. This entry was posted in Poetry and tagged Blessed Virgin Mary, Catholic, Catholicism, Feast of Our Lady of Guadalupe, Marian Apparitions, Mary, Mexico, Our Lady of Guadalupe, Poems, Poetry, Roman Catholic, Saint Juan Diego on December 9, 2017 by The Mithril Guardian. I would have included the Aztec in this post, except that I could not be sure I would not misspell a word. It is probably possible to find Tonantzin Icuic somewhere on the Internet; it may even be possible to find the song being sung. I do not know. If, however, these two options are somehow unavailable, I recommend you try to find America’s Treasure: The Virgin of Guadalupe. It is a fascinating little book, with lots of amazing details – including this song! This entry was posted in Holidays, Poetry and tagged America’s Treasure: The Virgin of Guadalupe, Aztec, Blessed Virgin Mary, Cathol, Catholic Poetry, Catholicism, Feast of Our Lady of Guadalupe, God, Guadalupe, Helen Behrens, Mary, Mexico, Roman Catholic, Song to Our Mother, St. Juan Diego, Tonantzin Icuic on December 9, 2016 by The Mithril Guardian.